Imagine if every supermarket carpark across Scotland contained recycling bank, which provided rewards for those who dutifully put bottles, glasses and cans in their correct repositories? Think of all that would be put back into the production cycle and diverted to landfills – the millions saved. Our society is too eager to sell as much as possible, but tries to ignore what happens at the disposal stage. Yet, even a small incentive – representing part of the money saved through recycling – could make a big difference in motivating more people to be environmentally-friendly. The tragedy is we very rarely assign values to packaging and live in a bubble of wasteful affluence that just chucks it all out, regardless of the cost. Those glass Irn Bru bottles, which now offer 40p if returned, are a great example of a how a wee reward can change people’s behaviour. We need more recycling and we should be prepared to pay, so that everyone sees the necessity. Apparently this “Automated Can Crusher Sorter” machine was first introduced to the UK in 2004 and was developed in Norway. Why do we not see more of these all over our country? 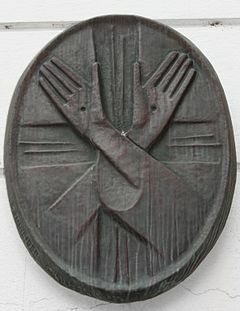 As Wikipedia informs us, stigmata (singular stigma) is a term used by members of the Christian faith to describe body marks, sores, or sensations of pain in locations corresponding to the crucifixion wounds of Jesus Christ, such as the hands, wrists, and feet. The term originates from the line at the end of Saint Paul’s Letter to the Galatians where he says, “I bear on my body the marks of Jesus.” Stigmata is the plural of the Greek word στίγμα stigma, meaning a mark, tattoo, or brand such as might have been used for identification of an animal or slave, criminal or traitor. This visibly identified them as a blemished, morally polluted person, someone to be avoided or shunned particularly in public places. An individual bearing stigmata is referred to as a stigmatic or a stigmatist. Astonishingly, Jesus Christ bore the ultimate stigma for us. He was branded as the most despicable of criminals by the nail-shaped scars on his hands and feet. He was visibly strung up and ridiculed as one who was ‘beyond the pale’, an anathema, but He alone was perfect, spotless and without fault. He truly was Isaiah Suffering Servant, as foretold by prophecy, over 500 years before His birth: “By His wounds we are healed”. He was rejected and condemned, so we could be accepted and forgiven; He was chained and scourged, so we could be freed and delivered from the punishment we deserved. In Christ Jesus, we need fear no stigma or oppression, because He redeemed the epitome of cruelty into the embodiment of love. Through Christ alone, the shame and scorn that can be heaped upon us, becomes the marks of our discipleship and the blessing of sharing in His sufferings. The scandal of grace is He died in our place. The wonder of Easter is He rose again to reign – death could not hold Him and cannot vanquish us, because in Him we are more than conquerors. That’s the most amazing, Good News. Never let Christ’s censures of all that is evil and destructive of human happiness blind you to the awesomeness of His solution. Instead of handing down judgment from on high, love came down to earth and stood in our place, bearing the scourge that was meant for us. No greater love has anyone than this but to lay down His life for another. We’ll never know a better story, never experience a deeper kindness, never be satisfied until we find new birth in all that Jesus Christ is, and has done.